BACKGROUND: Russian knapweed is an invader from the Caucasus in southern Russia and Asia. It spreads by seeds and from shoots arising from creeping roots. It can produce up to 27 root shoots/sq it, and roots may grow to 23 feet deep. 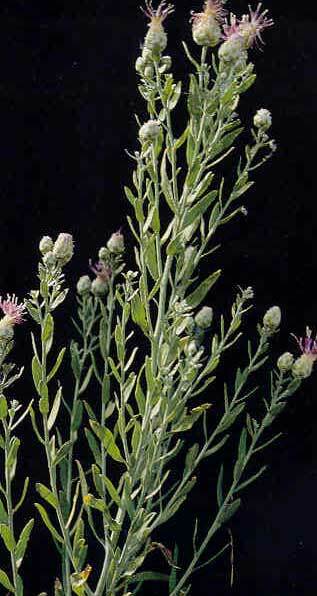 Russian knapweed causes chewing disease in horses. DESCRIPTION: Russian knapweed is a perennial whose stems are considerably branched and up to 4 feet tall. Leaves are up to 6 inches long near the base of the plant, entire to few-toothed, and are smaller toward the top of the plant. The flower heads are about 1/2 inch in diameter and are borne on branch tips during summer and fall. The flowers may be white or pink to lavender-blue. Greenish to straw-colored bracts are tipped with a papery, pointed margin. Ivory-colored seeds are tipped by plumes that fall off at maturity. Roots are dark brown to black. DISTRIBUTION: Russian knapweed is found throughout the western U.S.
CONTROL: A biological control agent (a stem/leaf gall nematode) is available for control of Russian knapweed, but control levels have not been determined. Herbicides can provide excellent control.